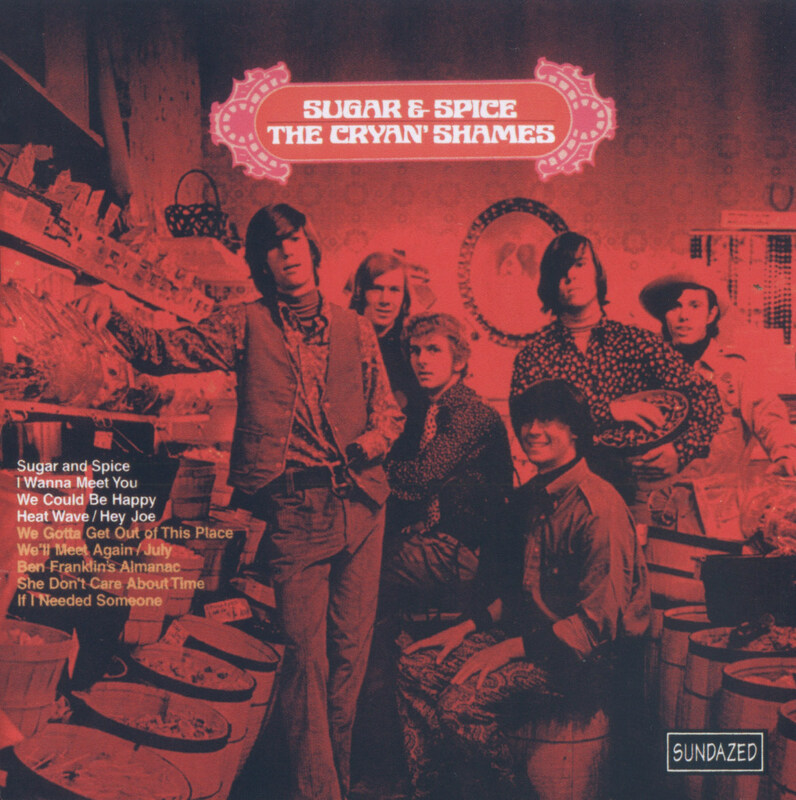 The Cryan' Shames actually were a big deal in Chicago in the mid- and late '60s, when a bunch of their singles hit the local Top Ten; some of them were small national hits as well. The biggest of these was "Sugar and Spice," a cover of a Searchers song that made the Top 50 in 1966 and was later featured in Lenny Kaye's renowned Nuggets anthology of '60s garage bands. In their original incarnation, the Shames leaned toward the pop end of garage. Borrowing heavily from the Beatles, the Byrds, and the Yardbirds, guitarist James Fairs wrote a clutch of energetic guitar pop/rockers with sparkling harmonies. After 1966, the group pursued an increasingly mainstream pop direction featuring saccharine arrangements and material. In this respect they uncannily mirrored the devolution of local rivals the New Colony Six, who also shifted from tough pop/rock to MOR in their bid for national success. But the Shames' appeal endures, partly through the efforts of reissue/archival labels such as Sundazed Records, which have kept their music available into the 21st century, and some of the original members, who have kept the band alive as a performing outfit from the 1980s onward. They actually started out in Hinsdale, IL, as the Prowlers, a trio formed by Gerry Stone (rhythm guitar), Tom "Toad" Doody (vocals), and Dave Purple (bass, keyboards), who added guitarist James Fairs and drummer Dennis Conroy, both late of a local band from Downers Grove called the Roosters. The quintet became the Travelers, specializing in R&B and rock & roll covers, though Fairs was starting to write originals as far back as 1964. They became a sextet with the addition of Jim Pilster, a one-handed tambourine player whose artificial extremity got him dubbed "J.C. Hooke." Included in their ranks were four singers who were capable of handling lead vocals as well as harmonies, and as they already had their rock & roll and R&B sound down, they emerged as a heavyweight outfit on the local band scene, equally adept at covering the Beatles, the Byrds, or the Rolling Stones, among others. Additionally, as they discovered, Pilster's presence lent them some novelty/publicity value as "the guys with the hook," an attribute that would also benefit the Barbarians around the same time, who sported a member with a replacement appendage. According to biographer Clark Besch, they were making upwards of $180 a gig (albeit split six ways) in 1966, a good fee for a group that had never recorded. They also attracted the attention of manager Bob Monaco, who was associated with the local Destination Records label, and hoped to rectify that gap in their biography in short order. Sugar & Spice Their new name was imposed upon them when they were notified that another band had a prior claim on "the Travelers" -- as they told Besch, the situation was described by one of the affected parties as "a cryin' shame," and that became their new name. The group and Monaco intended to make their recording debut with George Harrison's "If I Needed Someone" -- a new Beatles song not yet available in the U.S. -- but were thwarted, as the Beatles' publisher wouldn't allow the release. Instead, they grabbed up another, older British Invasion-spawned original, "Sugar and Spice," written by producer/composer Tony Hatch (under the pseudonym "Fred Nightingale") for his client group the Searchers. The number had been in the repertory of another local band, the Riddles, and they got their version out through MG Productions on a tiny local label. The resulting single, which included a proto-psychedelic Fairs original called "Ben Franklin's Almanac," became a Top Five hit locally in Chicago, and attracted the attention of Columbia Records, which bought up their contract and put the record out nationally. It easily made the Top 50 and Columbia wanted more -- the band duly obliged with "I Wanna Meet You," another Fairs original, which only made the Top Ten locally and number 65 nationally. Columbia was still interested in an album, however, and the group delivered the 12-song Sugar & Spice long-player. It was a fairly good record of its kind, mixing covers and Fairs' originals and, as it was done on a tight budget -- basically Columbia accepted the record as delivered, according to Pilster in an essay by Besch -- it also included all four single sides, plus their proposed debut of "If I Needed Someone." Although the album barely cracked the Top 200 nationally, the single and the long-player between them helped raise the band's fees more than fivefold in just a matter of weeks. A Scratch in the Sky It all wasn't a bad beginning, and might have led to better things for the band, if it hadn't been for the Vietnam War and the military draft, which cost the Shames the services of Gerry Stone. Lenny Kerley, late of the Squires, was his replacement, and was soon partnered up as a songwriter with Fairs, generating a third single, "Mr. Unreliable," which made the Top Ten in Chicago. The Cryan' Shames continued to enjoy immense success locally in Chicago, without parallel sales in the rest of the country -- fortunately, they were not costing Columbia a great deal, and the Chicago music marketplace was important enough to keep the label interested. Their fourth single, "It Could Be We're in Love," recorded and released in the late spring of 1967, topped the local listings, without breaking through nationally. There were some lineup changes around this time, as guitarist Isaac Guillory came in on bass, taking over for Dave Purple, who was drafted that year. 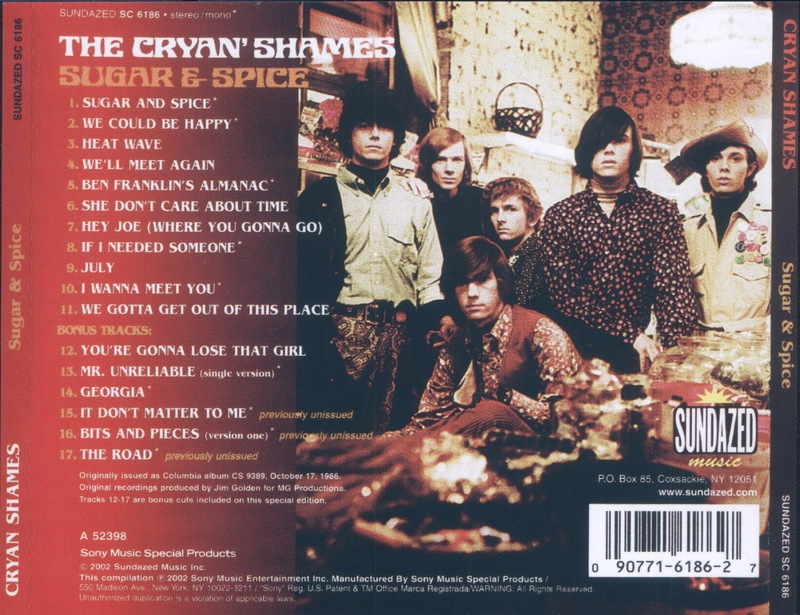 And a second album, entitled A Scratch in the Sky, issued in December of that year, actually sold somewhat better than their debut LP, reaching number 158 nationally; in contrast to the mix of garage punk, British Invasion, and folk-rock sounds on Sugar & Spice, A Scratch in the Sky was an ornate sunshine pop/psychedelic work, reminiscent of the Association or, perhaps, the Left Banke. The group saw a string of departures in 1968 and 1969, most notably that of James Fairs, and although the Cryan' Shames continued to record and perform with a new lineup -- featuring Saturday's Children alumnus Dave Carter on guitar and former Squires/Boston Tea Party member Alan Dawson on drums -- a lot of continuity was sacrificed. Dawson also left in late 1968, though not before contributing to their final album, Synthesis. They broke up in the last month of 1969. Since then, there have been reunion performances by various members and the formal reactivation of the group in the late '80s, which continued as of 2009. The Cryan' Shames' debut album was typical of the more thrown-together rock LPs of the era: both sides of their first two singles and a bunch of cover versions. The singles, actually, were pretty good, including their most well-known song, "Sugar & Spice," a cover of a Searchers hit that actually was more memorable and imaginative than the original. Its B-side, "Ben Franklin's Almanac," was a respectable original with shades of the Byrds, the Yardbirds, and California harmonies; the second single, "I Wanna Meet You," was a decent meld of Beatles-Byrds jangle with Beach Boys harmonies; and its flip, "We Could Be Happy," was an OK soft rock number. Throw in the sole original composition not from a single, "July" (one of the better 1966 Byrds sound-alikes), and you have half a decent (though not great) period pop/rock album. The problem is, though, that the cover versions that fill out the record -- including songs written and/or popularized by the Beatles, the Byrds, and the Animals, along with "Heat Wave" -- are neither too creatively done nor even imaginative selections. "Sugar and Spice" and all four of the originals appear on the Legacy compilation Sugar & Spice, which makes this album superfluous if you already have that anthology. The 2002 CD Sundazed reissue is bolstered by six bonus songs: their 1967 single "Mr. Unreliable" (different from the LP version) and its laid-back B-side "Georgia," a cover of the Beatles' "You're Gonna Lose That Girl," and three previously unreleased 1969 tracks that found them going into a mellow folk/country/soft rock direction. Over 3 albums, The Shames were certainly some of the best pop from that era.